One of the reasons for the “Edgewood’s Got Creative Talent” exhibition at the Museum was to inspire and motivate people to explore their own interests and talents, and to acquaint them with options they might not have considered as a means to express themselves. Along those lines, we have added an interesting display to the Museum permanent collection–flintknapping! 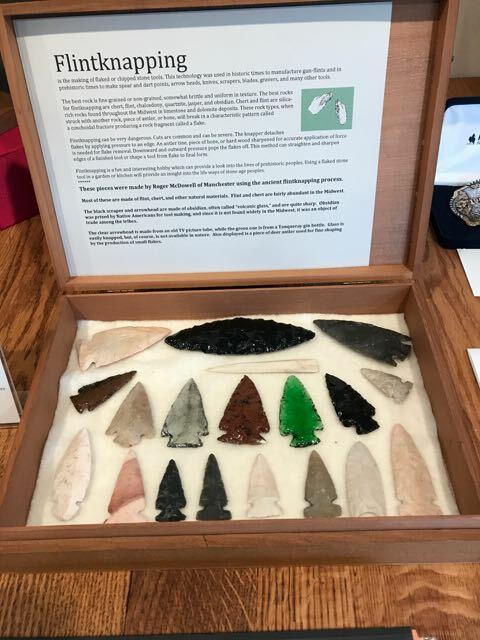 Many of us are familiar with the arrowheads that are commonly found just north of Edgewood near Bixby Park, but did you ever consider how those were made thousands of years ago by hand without advanced technology? Being able to make a sharp stone tool to skin an animal for clothing or shelter, and butcher it for food meant the difference between living and dying for Native Americans and other world cultures. Flintknapping is the art of creating tools by flaking the right type of rock with primitive hand tools. This technology was used in historic times to manufacture gun-flints and in prehistoric times to make spear and dart points, arrow heads, knives, scrapers, and many other tools. Roger McDowell, of Manchester, has loaned us a few of the hundreds of objects he has created using this age-old process. Most of the pieces in McDowell’s exhibit are made of flint, chert, and other natural materials. Flint and chert are fairly abundant in the Midwest. Also displayed is a piece of deer antler used for fine shaping by the production of small flakes. The black arrowhead and the scraper are made of obsidian, often called “volcanic glass,” and are quite sharp. Obsidian was prized by Native Americans for tool making, and since it is not found widely in the Midwest, it was the subject of trade among Native American tribes. The clear arrowhead is made from an old TV picture tube, while the green one is from a Tanqueray gin bottle. Glass makes good flintknapping material, but of course there weren’t Zeniths and liquor stores in pre-Columbian North America! The best rock for flintknapping is fine grained or non-grained, somewhat brittle and uniform in texture such as chert, flint, chalcedony, quartzite, jasper, and obsidian. Chert and flint are silica-rich rocks found throughout the Midwest in limestone and dolomite deposits. These rock types, when struck with another rock, piece of antler, or bone, will break in a characteristic pattern called a conchoidal fracture, producing a rock fragment called a flake. The knapper detaches flakes by applying pressure to an edge. An antler tine, piece of bone, or hard wood sharpened for accurate application of force is needed for flake removal. Downward and outward pressure pops the flakes off. This method can straighten and sharpen edges of a finished tool or shape a tool from flake to final form. Flintknapping is a fun and interesting hobby which can be very satisfying, and provide a look into the life ways of stone age peoples. Link to a YouTube video about making a stone tool by flintknapping. "Support for web design services provided by the Upper Mississippi Gaming Corporation"